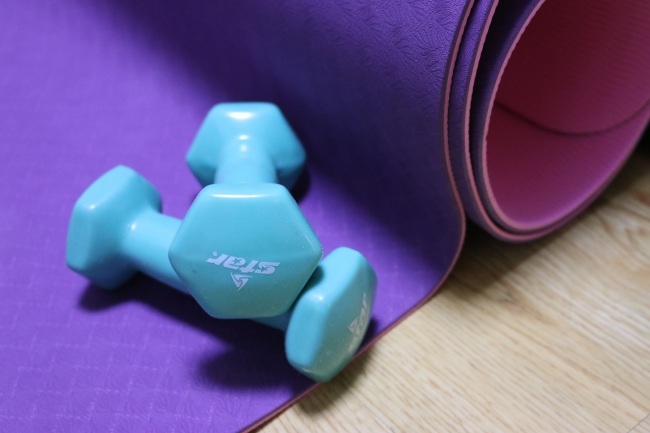 Working out at home, often referred to as “home training” in Korea, is rising as a trend among busy modern consumers. Without leaving the comforts of the home, people are able to carry out an extensive workout, proponents say. A wealth of home training videos available online allow those pressed for both money and time to stay fit with less hassle. Along with the fad, there has been a rise in sales of exercise equipment for those opting to break a sweat at home. In January, sales of yoga mats rose 36 percent at online retailer Gmarket compared to the previous month. Sales of yoga towels rose 276 percent, while sales of cycling machines rose 134 percent in the same period. In 2012, some 69 patents were submitted for home exercise equipment, according to the Korea Intellectual Property Office. Last year, the number more than doubled to 152. For Choi Han-yul, 30, the freedom to adjust to her schedule is a crucial advantage to exercising at home. The lawyer of three years has maintained a home training routine of her own curation since her law school days, says Choi. When she was studying for the bar exam, saving both time and money was important, which is how Choi got into home training. “It felt like such a waste to go to the gym, especially when so much information is available online,” she said. She enjoys being creative in her workouts, and takes full advantage of the myriad of themed exercise routines tailored to Korean audiences. Videos available online include those on silent cardio exercises to avoid disturbing neighbors on the floor below -- a common problem in Korea’s densely populated apartments. There are arm muscle training moves that do not use weights, and stretching routines you can follow in bed. Then there are yoga instructors who show tutorials with their pet dogs. “There’s so much creative content on the internet that working out at home can be more diverse than people think,” said Choi. For Choi, it is crucial that exercising never feel like an additional obligation in her day, but an enjoyable, voluntary activity. Now employed, Choi is financially freed up, but even more restricted in time. Going to the gym after getting off work late at night seems unreasonable to her. Many of her colleagues, however, feel the obligation to be registered as a regular member at a gym, even if just for the sake of the illusion of diligence. Equipment Choi uses at home: an exercise ball, a yoga mat, 1.5-kilogram weights, a foam roller, and a jump rope. To Lee Ju-hee, 29, the thought of dressing up in stylish workout attire and being self-aware while exercising -- perhaps just to pose in front of the gym’s full-length mirror and grab a snap for social media -- is daunting. She wants to focus entirely on the motions when she’s working out. “There’s an odd sort of pressure when you’re at a gym, especially an expensive one,” she said. At home, Lee is able to concoct a health routine customized for her body type, stamina and interests. Wanting to slim down her lower body, she began following the famous leg- stretching regime of model Kang Ha-na, one of the most-viewed fitness gurus in Korea on YouTube. A dance enthusiast, she watched K-pop dance tutorials on YouTube and followed along. Yoo Seung-min, 31, enjoyed jogging along the Yangjaecheon, a stream flowing nearby his house in the district of Gangnam. Bolting through the outdoors air offered a rare reprieve in his day, said Yoo, who works at a beverage conglomerate. But Seoul’s worsening air conditions have forced Yoo to look into freehand exercises, as well as push-ups and squats at home. Yoo has even considered investing in a game console to aid his indoor workouts. Last month, the government issued alerts for high fine dust levels in the air from March 24-30. In the wake of rising concerns, some schools, including Seoul Banghak Elementary School, have begun adopting virtual reality sports into their physical education program. After giving birth to two sons, Park Smi thought her figure would instantly boomerang back into shape, like celebrities featured in magazines. Despite numerous attempts at dieting, she was instead left with hair loss, depression and weight gain. 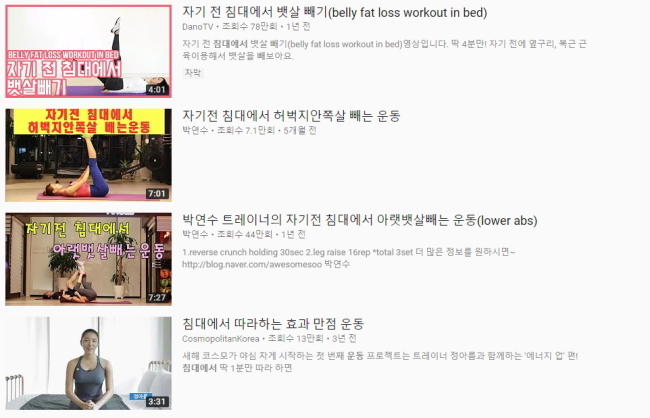 Park decided to curate her own routines, incorporating both exercise and diet, and share them via YouTube. Dano TV’s Lee Ji-soo gained a lot of weight while studying abroad in the US. She discovered that misinformation abounded online when it came to dieting, and was inspired to create a fitness company that paid detailed attention to women and their bodies. Dano’s YouTube channel and website, which now sells customized diet food, offers tips on easy-to-follow workout routines and daily habits.